Coro dei Santa Fiora brings the traditional repertory of centre Italy back to life and make it better, choosing the ways and forms to play it. The group formed just three years ago, but is really energic and genuine. Important is their collaboration with Simone Cristicchi. 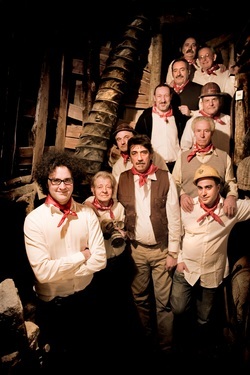 “Coro dei minatori”(Mineworker chorus) – name took from a traditional music group of ‘70s- was born three years ago wanted by “Consultacultura” association, with the purpose to recover and to interpret in an current way the big and original popular musical repertory of Santa Fiora and Amiata hill. The group is formed by Giuliano martellini (main voice), Piero D’Amario, Lino Nucciotti, Renzo Verdi, Lucio Niccolai (guitar), Giuliano Travi and Osvaldo (accordion), Ennio Sensi and Alex Travi. They want to bring the traditional repertory back to life and make it better, choosing the ways and forms to play it. The most important tracks are: ‘La Puscina’, the only piece where text talk about mineworkers. ‘Oh bella, oh bella’ is a Santa Fiora originally song with beautiful metaphors. ‘Vien la primavera’, ‘Lisa di Santino’, ‘Bella se voi venì’ and more. The group performed in several important occasion and often in the famous club ‘The Place’ in Rome. Famous is the collaboration with Simone Cristicchi.